Roast coriander, cumin, 6 red chillies, 1 sprig curry leaves, pepper, asoefetida, 1 tsp mustard, 2 tsp sesame seeds, 1/2 tsp channa dal,1 tsp urad dal and 2 tsp peanuts, one by one, till they begin to release aroma. Cool down and grind in a food processor, to make a fine powder. Set aside. Mix in roasted coconut and blend once again. Set aside. Heat some oil and put the remaining mustard seeds, red chilies, urad dal, channa dal, peanuts, sesame seeds and curry leaves. Add tamarind juice and salt/jaggery when the seeds begin to splutter. Mix well and add salt to taste. As the liquid begins to boil, add powdered masala and continue to simmer, till you get a sticky masala. You can store it for a month in an airtight container, in the refrigerator. 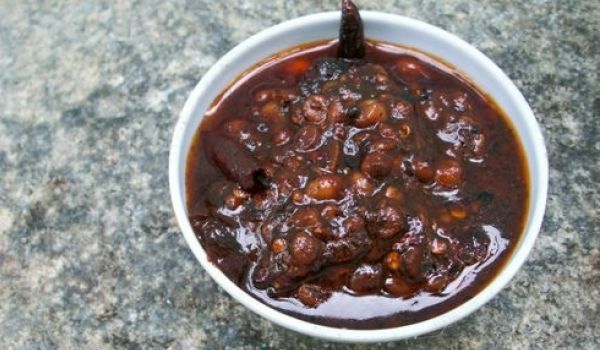 Mix the masala with plain cooked rice to make puliyogare.